The winery is located in Piesport, home of the Goldtröpfchen (literally “Gold droplets”). People in the United States mostly know the ubiquitous Piesporter Michelsberg, a cheap and sweet wine. That, unfortunately, is the least appealing vineyard in Piesport. 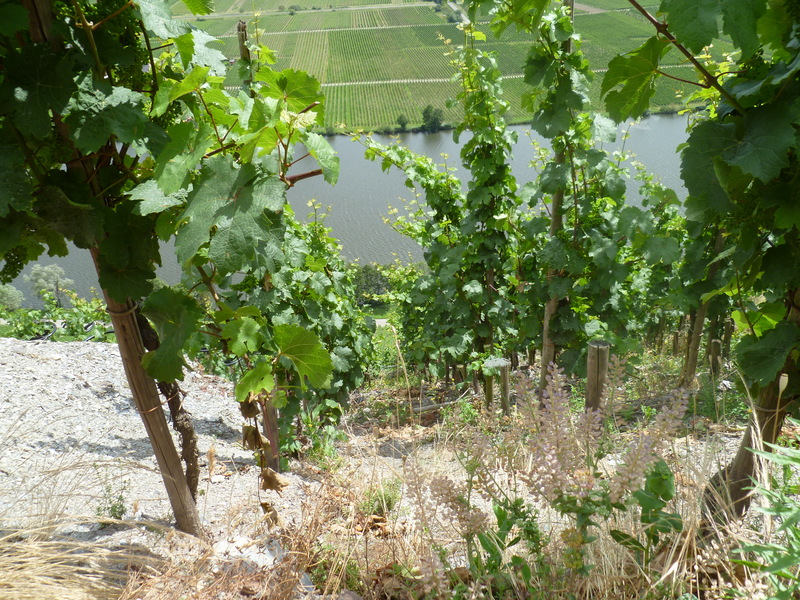 Unlike the other Piesport vineyards Goldtröpfchen, Domherr and Falkenberg, it is not located on the Northern side of the Mosel, where it would get full sun exposure all day, but on the South bank of the river, in flat terrain that used to be farmland and was not used for growing wines until a couple of decades ago. The Goldtröpfchen, in contrast, features steep vineyards and some of the best wineries all have holdings there. Another thing one should know is that the Goldtröpfchen used to be much smaller and was extended significantly under the German Wine Act of 1971 (as happened to most well known vineyard sites in Germany). The winery Kurt Hain has been one of my favorite wineries in the Mosel village of Piesport. Gernot Hain, the winemaker (follow the link for a photo and his philosophy), has been making high quality wines for quite a bit now, and they rarely fail to impress me. They have a balance and sophistication about them that just draws you in. There is someone who knows exactly what he is doing…and he is doing it remarkably well. Whenever I want to really impress friends that are not very familiar with German wines, I pull out one of his bottles. They hardly ever fail to make their point. 2010 was what many people called the crazy vintage along the Mosel: Lots of acidity and lots of sugar led to levels of each that were puzzling to many winemakers. It wasn’t easy to make great wines in that vintage but those who succeeded made wines that are to die for. They have all the beauty of ripe grapes, but then take you away with their rather racy acidity. It is unclear how they will age, but they are still drinking phenomenally right now! But to the wine, one of two of Kurt Hain Spätlesen from the Goldtröpfchen. Gernot selects the grapes from different holdings in the vineyard that have different soil types, namely grey and red slate (Grauschiefer and Rotschiefer). He used to give them numbers to distinguish but as of late has started just putting Grauschiefer or Rotschiefer on the label which helps a lot (I am numerically illiterate). This wine was a Grauschiefer, so grey slate soils. In the glass, it had a great, light yellow color. In the nose, there was a combination of citrus and honey, with underlying white peach aroma. 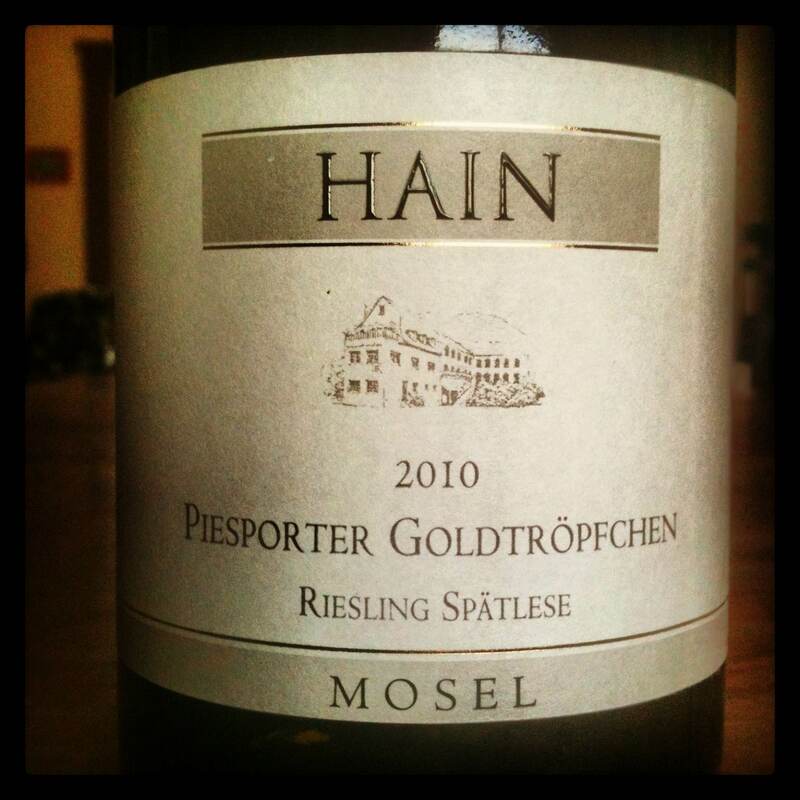 Just as gorgeous as a Mosel Riesling can be. On the palate, it was a classic, exciting 2010: light to medium-bodied, sweet. But boy was the sweetness carried by wonderful acidity that kept it fresh and enticing. The acidity never dominated the wine, just gave it structure. Stunning in its balance and fruit. Very long, lingering finish. Just an excellent piece of work. I tried a 2007 vintage of this wine last year, the review is here. Thanks so much for pulling this out that night Oliver–it certainly was a treat! Okay I’m convinced I have to go to Germany–can’t get the good wines here. definitely looking for Rieslings this weekend! I am always so jealous because I am unable to find many of these wines in my area! But I will keep looking and some day my efforts will hopefully be rewarded. Maybe some day… a girl can hope! I will ask my distributor to bring some German Rieslings for us to sample for the lineup for the wine bar. Any other specific recommendations? Thanks for the informative write-up. 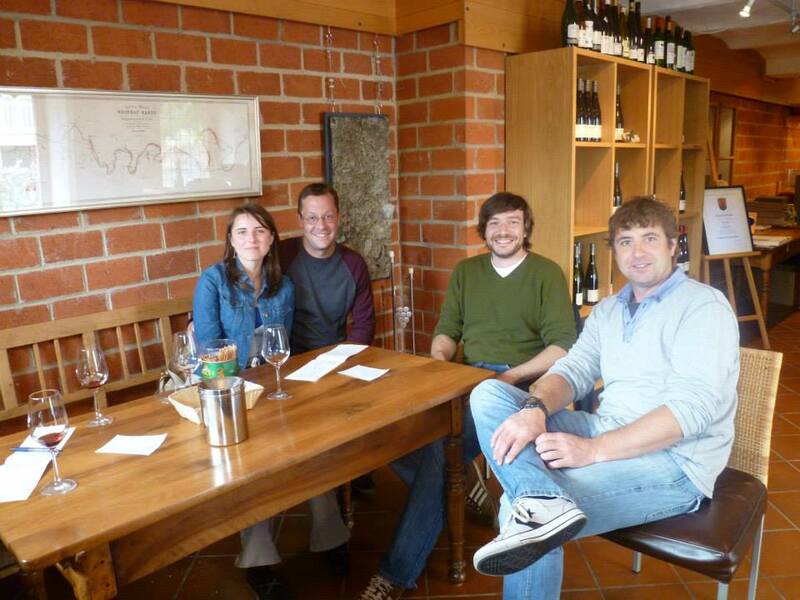 A big fan of Mosel, spending many months here… if you are loving the lesser known guys, please check out the young winemaker Philip Kettern of Lothar Kettern. He’s really making a name for himself. One to watch. Cheers! Oh great! Thank you so much for that tip! I am always on the look out for up and coming winemakers. Very much appreciated!